If you are a caterer, the following guidelines outline La Poste’s expectations when a client hires you to cater an event in our facility. If you have not catered an event in our facility, we will require you to come in and take a quick orientation tour of the facility, and go over our guidelines. We will ask for your signature, confirming that you have read, understood, and agreed to follow our guidelines when catering an event in our facility. If you are a client, and are looking to hire a caterer for your event, the following guidelines will help you determine if your prospective caterer might be a good fit for you and our facility. We suggest you print out the guidelines, or point your caterer to this page on our website to help you with your choice. 1. At least 30 days prior to the event, the caterer must provide La Poste with: A copy of the license to Operate a Food Service Establishment, and a certificate of insurance, evidencing workers compensation insurance, and commercial general liability insurance in the amount of, or greater than $1 million dollars. 2. It is not required for the client to use only those vendors from the preferred vendor list, but if a client wishes to use a caterer who is not on our preferred vendor list, prior approval must be obtained from La Poste. 3. La Poste reserves the right to refuse use of certain caterers, designers, rental companies, disc jockeys, bands, or any other party or vendor supplying goods or services. 4. Approximately 2-3 weeks prior to the event, a walk-through must be held to go over the details of the event with a member of La Poste’s staff. The caterer and client must both be present for this walk-through. 5. Care must be taken never to drag furniture on the floors during set-up and clean-up, as this can damage the floors. If damage is done to the floors, you will be held responsible for their repair. 6. Alcohol service must cease 30 minutes prior to the end of the event, or at 12:01 AM, whichever comes first. No alcohol is ever permitted on a self-serve basis, and you may not leave bottles on the tables for guests to serve themselves. The bar staff, and catering staff must take precautions not to over serve, and alcohol service to visibly intoxicated guests is not permitted. It is the caterer’s responsibility to enforce these rules. 7. A waterproof mat must be used under any and all food or liquid areas, or areas where leakage may occur. Only leak-proof containers or coolers may be used, and all containers holding liquid or ice must be placed on a waterproof mat. The caterer is responsible for the repair of any damage done to the hardwood floors due to leakage. 8. All deliveries and pick-ups should occur during the time the client has rented the facility for their event. Any deliveries and/or pick-ups occurring at times other than the specifically stated rental time in the client’s contract must have prior approval by La Poste. La Poste is not responsible for the timeliness or accuracy of deliveries made by the client, and/or their vendors. 9. The caterer will be in charge of clean-up after the event, and clean-up may not be allocated to anyone else. The caterer may not leave before the event has concluded, and clean-up has been performed to La Poste’s staff satisfaction. Clean-up must take place during the time that has been rented by the client, and the client is responsible for any fees for time overage incurred by their vendors. 10. Clean-up after the event shall include: Absolutely no ice, food, garbage or grease shall be disposed of in the bathroom sinks or toilets. Floors must be swept of any large debris, and checked to insure no moisture is present. All trash, including trash in restrooms, must be removed from the facility. Bottles and cans should be placed into the recycle containers. 11. All food and beverages must be removed from the refrigerator and freezer. All kitchen surfaces must be wiped down, and left as clean as they were found prior to the start of the event. 12. Smoking is not permitted anywhere within the building. 13. Furnishings and artwork may not be moved without permission and supervision by La Poste staff. All furnishings that have been moved must be returned to their original placement, again under the supervision of La Poste staff. 14. Absolutely nothing may be taped, stapled, glued, nailed, or otherwise attached to the walls, floors, or ceilings without prior approval of La Poste staff. 15. All candles must be encircled by glass, and every effort must be made to prevent wax damage and to prevent injury by such items from occurring to guests. Prior approval of questionable decor is advised to ensure acceptability. La Poste staff may reject the use of any decor that may cause damage to the guests or the facility. 16. 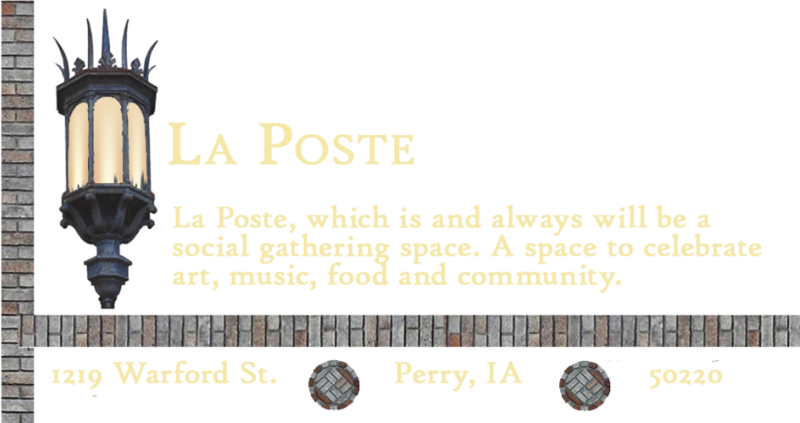 Caterer/Vendors are required to check out with La Poste staff at the conclusion of the event. La Poste staff must confirm that all policy and procedures have been followed, and that the facility has been left in a satisfactory condition. 17. La Poste retains no responsibility or liability for items brought onto the property, or for any items not removed at the conclusion of the event. 18. Rental companies must remove items in a timely manner, and at a time occurring during regularly scheduled business hours. Items not removed within 24 hours will be disposed of. Caterer hereby does acknowledge receipt of the above rules and regulations, and further acknowledges that any and all contracts for services relating to the event are subordinate to this agreement.